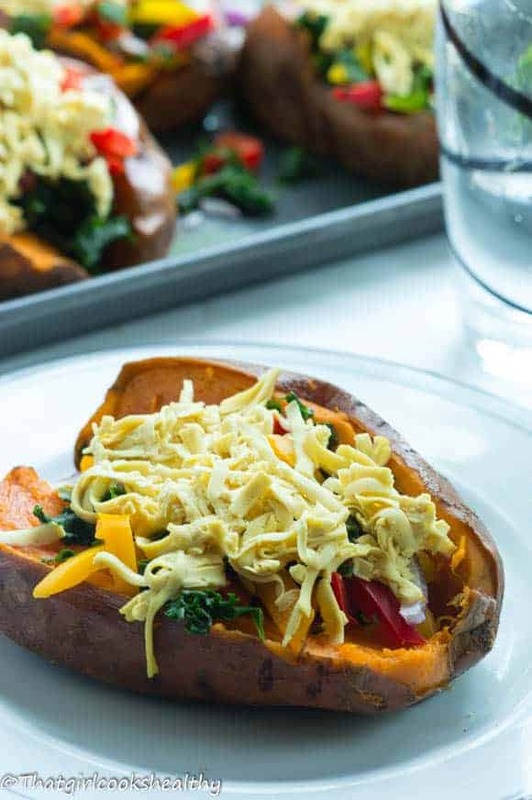 Loaded sweet potato skins – a tasty week night dinner consisting of potatoes stuffed with a medley of fresh veggies and topped with dairy free cheese. Now that the dairy free cheese recipe is officially on the website I think it’s about time I showed you guys just how creative one can be with this nut cheese. I couldn’t resist submitting these loaded sweet potato skins as the ultimate teaser. I’m sure it’s safe to say most of us have tried loaded potato skins at some point in our lives. When I was younger my mother would make these as an appetiser while she would prepare a rather large dinner for myself and co.
My favourite variation was the cheese and chive skins. I would warm them up, scoop out the inside to eat and then eat the skin by itself, sounds weird right? If it’s weird then it has my name all over it, I kid you not. The potato skins are loaded with nothing but goodness, there’s no gooey ingredients that will leave you bloated or laden with a layer of grease. 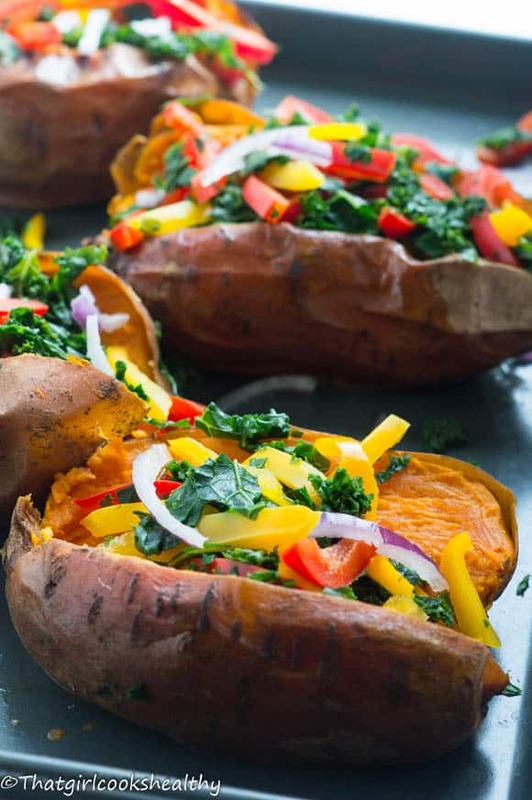 Instead of paired the sweet potatoes with some sweet bell peppers and curly kale to supplement your daily dose of vitamin C and B. A component that’s guaranteed to boost your immune system and help to rejuvenate both red and white blood cells, not bad huh? Needless to say the health properties render this dish child friendly as well as suitable for vegan, paleo, gluten and dairy free, so it’s a great meal or appetiser (choice is your’s) for most dietary lifestyles. 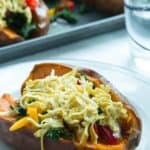 What to add to loaded sweet potato skins? 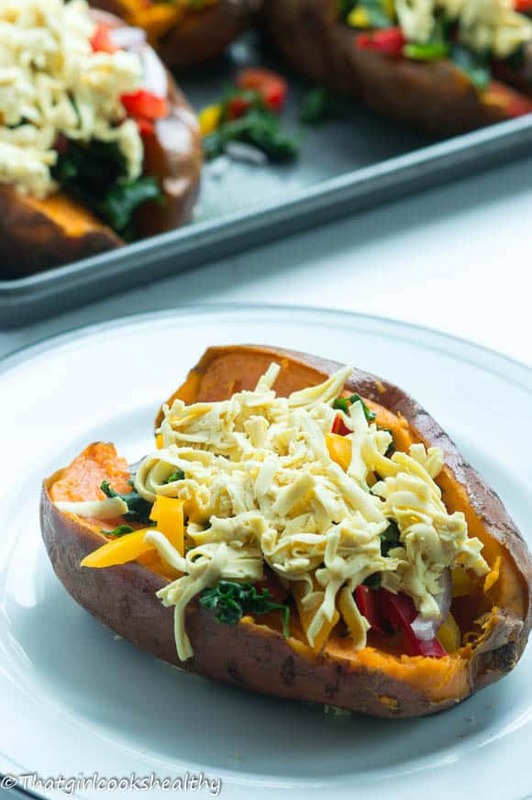 You can load the sweet potato skins with more veggies if you wish, you can’t go wrong with overindulging in vegetables, they not only a great source of healthy carbohydrates but also low in fat. Anything from spinach, mushrooms, corn, peas just to name a few! The loaded sweet potatoes will need to be baked in the oven, use large potatoes if possible. Unlike white potatoes, sweet potatoes have a tendency to soften to the point of almost collapsing on itself hence the reason why you need big daddy ones. 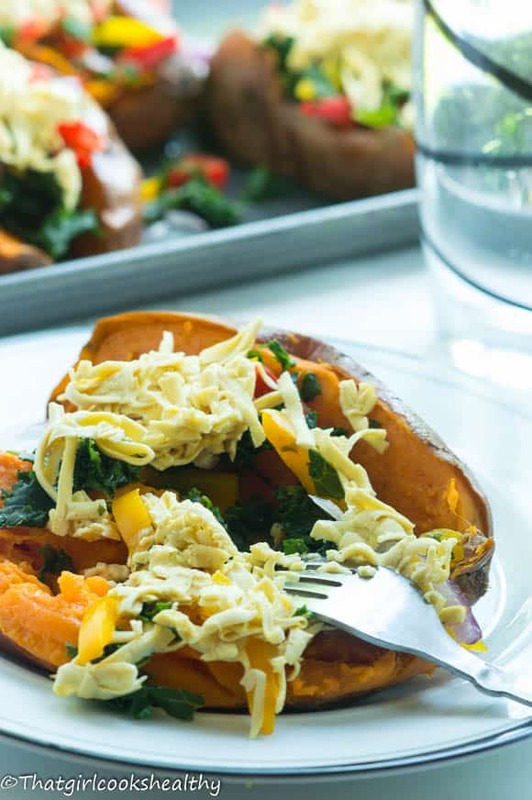 They also take some time to cook, about 40-50 minutes depending your oven, during this time, you might want to commence with preparing the filling – veggies with my dairy free cheese. When the potatoes are finally done, you can cut them (assuming they are cool enough to handle) then apply the filling (simply steam the veggies in the saucepan) along with a sprinkle of nut cheese. I prefer to add the filling and eat right way, though, some people like to scoop out the majority of the potato and cream with additional cheese while the skins bake for a further few minutes and then finally add the filling. You can follow whatever method you prefer – just keep it healthy! season with himalayan pink salt, garlic, pepper, chives and chilli to taste. Preheat the oven at mark 6 or 200 degrees celcius. Prepare the sweet potatoes for baking by washing, scrubbing and patting them dry with a towel. Use your hands to rub some coconut oil, lightly over each sweet potato. prick each potato several times upon rotation before placing them on a tray lined with parchment paper to bake for 40-50 minutes.As the potatoes bake get the filling ready for serving, in a large saucepan steam the kale and bell pepper slices in a small amount of water for 5-6 minutes then drain and set aside. Once the sweet potatoes have cooked through, allow to cool slightly before slicing them lengthways. Fill each potato with a equal portion of veggies and cheese. If you’re doing the reloading method, scoop out most of the inside, cream with the dairy free cheese, return the skins to the oven to bake for a further 10 minutes then fill accordingly. Season with pink salt, garlic, pepper, chives and chilli. I just love the colors. All the ingredients I love. Thanks Gem, really appreciate your comment.